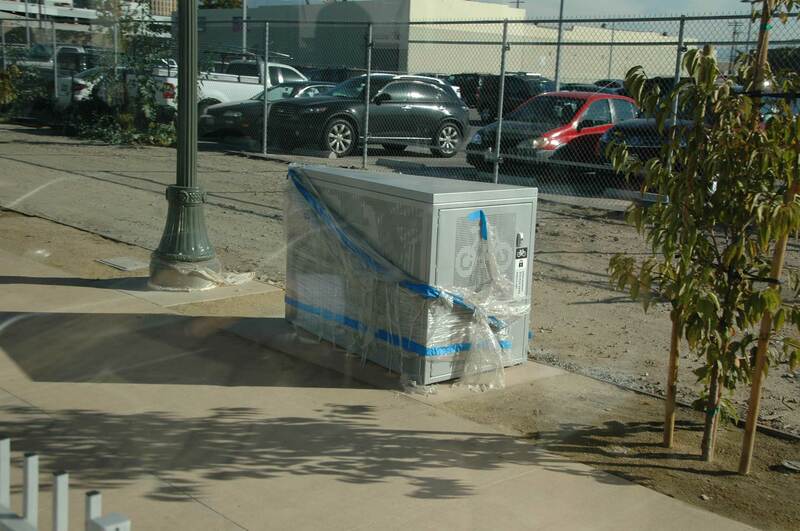 Bicycle Locker still under wraps at the Little Tokyo/Arts District Gold Line Station. In Metro’s glossy new brochures about the Metro Gold Line Eastside Extension, it’s hard to find any mention of the availability of bicycle parking at the line’s eight light rail stations that will run between Downtown and East L.A beginning Sunday. I find this curious, considering that the Eastside Extension has just one parking lot at the East L.A. Atlantic Station terminus. The only other parking resides at the other end of the line at Union Station. Either a lot of people will be doing kiss and rides (i.e., dropping their loved ones off at the stations), arriving to the stations by bus or either walking or riding their bicycles to reach the train. If you’re a cycling commuter, fear not. The agency has not forgotten about the needs of cyclists. Bicycle parking has been incorporated into station designs, even though the agency is apparently bashful in revealing the particulars. So, all you esteemed two-wheeled multi-modal commuters from Little Tokyo, Boyle Heights and East L.A., consider this your supplemental bike parking fact sheet for Metro’s newest rail line. Bike lockers located across the street. (No additional bike racks or lockers were added as part of the Gold Line extension. The agency’s planning department, however, is developing plans for additional bike parking at Gateway Center over the next year). Metro’s Bike Program tells me that the agency stands ready to install additional racks immediately as demand overshoots supply on the new line. Metro can also move lockers from one location to another if not fully utilized, again, based on need. Since there are more racks than lockers on the Eastside line, it will be very important for cyclists to properly lock their bikes to the racks to prevent them from being stolen. Lock it or lose it, the agency says. This rule applies anywhere on the Metro system. The best way to lock your bike is to use a high security chain or U-lock, and to secure both wheels in addition to the frame. Locker rentals, of course, are more secure, but require a $50 refundable key deposit and cost $24 for a six-month rental period. Call the Los Angeles County Bicycle Coalition at 213-922-2660 if you are interested in going this route. As for me, I won’t need a bike rack or a locker, because I ride a bike that folds neatly underneath a train seat. Ha Ha.